Last night I attended a fascinating medical lecture. The speaker certainly knew his stuff on how to use nutrition and oxygen and plant botanicals to heal the human body. You could tell that he wasn't some newcomer to the scene of health and science. His 15 years of lecturing came through beautifully. I certainly know that my health will be better for having attended. He also did an amazing job in better illustrating for me about the ills of canola oil and other vegetable oils, synthetics in our food, etc. Anyway, for some reason he was asked a question from the audience about water storage. What the audience member thought that had to do with his topic was beyond me, but he went ahead and took time to give her his opinion about water storage—the only problem was he was just a tad off. Being the consummate “purist” that he is, he hesitates to put anything in plastic unless he’s 100% certain that it won’t leach into the contents. (In fact, if you ever want to know if your essential oils are pure AND potent, put a few drops in a plastic baggie overnight and you’ll see degeneration the next day.) So in his opinion, when it comes to water storage he would advise everyone to use the hard plastic blue containers at the very least (usually found in 55 gallon increments), but also suggested you go to the trouble of changing them out every 6 months. Now, I won’t go so far are to say he was wrong on this aspect. Again, he is a purist and tries to only nourish his body with the best of the best. But, there’s a specific component to his advice that doesn’t transfer well into the world of preparedness. I know that a lot of my readers have e-mailed me questions on this topic as well, so I thought I’d set the issue straight. First of all, yes, it’s critical that you store your supplies, whether they be food, water, or even band-aids for that matter, in containers that will not leach poisons into them. I’ve seen too many folks buy pallets of the cheap bottled water that comes in the really soft water bottles. This is a bad idea. That plastic breaks down quickly and if it doesn’t poison your water first, it will disintegrate the water bottle and all your expensive liquid will serve only to clean the basement floor. So yes, using quality hard plastics is critical. Secondly, when it comes to storing up water for a “what if” scenario, you should err on the side of excess, not minimalistic thinking. Minimalistic thinking is only 1 gallon per person per day for the number of days you are striving to be prepared. I suggest you go back and do a search for “water” on this blog and catch some of the other articles that I’ve written about the critical nature of water to your health, your sanitation, and your sanity. One gallon per person is MINIMAL folks. Thirdly, when it comes to water storage keep a clear picture of why the water is being stored. Just like all of your other preparedness supplies, it is to get you from a point of loss to a point of comfortable living. What the consequences of this statement means is: no, you do not have to change out your water every six months. Because if you really wanted the water to be purist of the pure in the container you store it in, you would store it in glass (and risk losing it all in the event of an earthquake), or you would have your own private indoor mountain spring fed source, or you would change out the water every day. Before I sign off on this one, I want to give you all a word of caution. Please, for your own sake and that of your kidneys and liver, please do not indulge your thirst with AquaFina or Dasani bottled water. They are very acidic and they are cleaned with lye. And no, I couldn’t say that about such a big company if it wasn’t accurate. (So, Pepsi Co.—go ahead and have your attorneys call my attorney if you feel that I’m sharing inaccurate information. ) As a matter of fact, in my book I state that you’re better off storing your water from the best source you have available—which may only be your tap, as opposed to a well, and then be sure you have plenty of stabilizing and cleansing tools to use on your water when the time comes that you need to use it. I agree with you on your water storage plan and your thoughts on how long water can be stored. People also need to realize that in today's modern world, we use drinking quality water for ALL our uses, from drinking/cooking, to bathing/washing, to flushing the toilet. In a post calamity world, we will not be treating water to the level of our drinking/cooking water, for use in bathing or toilet flushing. So, with this in mind, we can reduce the energy we will be using to prepare our drinking water, since we would not prepare to drinking quality, all 55 gals of our drum. Also, we can reuse water, say our "grey water" from our bath or washing, used as black water in our toilets. So, one gallon of water can serve you at least twice, thus actually filling the role of 2 gallons. We don't normally think like this today, so it is a mindset and an understanding of our needs and processes available to us. I plan on boiling and ceramic filtering my drinking/cooking water. Pool shock will be used to treat bathing/washing water in quantity. These waters will be reused to flush toilets. Pool shock stores much easier and longer than bleach, and 1 lb will treat thousands of gallons of water. Do your research, not all pool shock can be used for consumable/potable water. I love how you reminded everyone about "grey water" and black water." Keep in mind tho that our bodies MUST have 2 quarts of drinking water daily minimum--especially in challenging physical and emotional circumstances. Personally, and this opinion has developed more strongly this year with research, I'm not fond of chemicals to treat my drinking water. I love how a silver charged carbon filter not only can clean my water, but also make it healthier for my body. I just love multi-purpose items like that! What is your opinion of the Water BOB - a 100 gallon bag that you put in a bath tub and fill? It comes with a pump also. I finally ordered one (has been on my ToDo list for months) and now am concerned that they didn't give more info on type of plastic that it is. It will only be used in an extreme situation as most of my water is in heavy plastic bottles. P.S. It lists for $40 but is $21.95 at campingsurvival.com. Getting the info on what type of plastic it is should be easy enough. I'd call them. Does it store well? I'm not very familiar with that one. OK Kellene....took your advise on the water (first siminar) I bought myself a NEW Berkly filter . My Christmas present to self!....extra black filters....just in case! LOL....This was number 1 on my want list as water is the most important! See what you have done....I now buy backups....and that is so handy OK here is the best tip of the day....WORK AT BEING PREPARED....You have given me enough interest to get out there and learn...I have learned so much....I go from site to site...( some good, some bad) yours is usually best!...I do a lot of reserch...I think this is what we should all do....( except the lazy ppl) You were right....my friends used to think I was a little touched in the head for doing this.....buying freezedried,storing water...etc....Now they are seeing the light, asking me what can I do? Again thank you for opening my eyes!!!!!!! Ps....Would love to take a first aid or medical seminar....any suggestions???? my first aid kit has grown from.....a box of bandaids to a real firstaid kit!!! Please keep up the good work....Am still praying for your friend. I'll keep plugging at the first-aid info for the blog, razr, that way you don't have to pay for a class. ok? Way to go on your efforts though! You can literally say that the world is a better place for you being in it now. Yes, do store _lots_ of water. If you can, do store water for flushing toilets when there is no water available from the plumbing. That water need not be drinkable, but is certainly handy to have. That is when those 55 gallon non-pure containers do come it handy, and most of those you can find free or for about 5$ if you ask around. I learned this from a friend of mine who had her water cut off for 2 weeks when construction crews a mile away re-routed the water service. She helped me to remember that it takes at least a gallon and a half for each flush. She said she and her neighbors spent a lot of time, money, and energy ( gas and weight lifting) getting water containers and hauling them around. When I offered her the opportunity to acquire 55 gallon containers, she wanted 10 of them!! Just on more tip. We stored ours next to the house covered with a neutral colored tarp. Our heating bill and cooling bill went down significantly--even though the rates went up. Hmm...I've never obtained new barrels like that for free. You must be one lucky gal. Also, keep in mind, that storing the water next to the house is fine folks so long as you don't store it on concrete that can be heated by the sun. That's when you have leaching problems. Thanks for your comments, Diane. You can flush a toilet with only two quarts of water if you pour it directly into the bowl, instead of filling the tank. Saves LOTS of water. You are lucky, I wish my friends and family would see the light about prepping even just a liitle bit. I have tried by starting to buying really cheap coupon items for them and they are shocked when they go to pay me back how little I have spent on them, but they do not want to stock up!!! So frustrating, inflation is slowly creeping in and I think it will only get worse!!! Thank you for your blog, I love it!! How timely! I was going to cycle my 55 gallon barrels today. It's a pain, and a security risk (living in suburbia...). I also have 5 gallon Mylar bags of water in boxes stored under my bed. Will those store as long as the 55 gallon food-grade barrels? Bless you for your work. Yes, I would feel comfortable with the mylar bags of water as well. 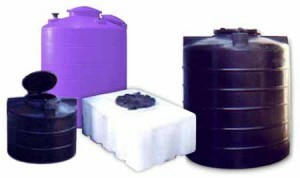 Just plan on treating/filtering all of your stored water. With three cats, using two litterboxes, I wind up with a LOT of large white 16 lb lidded containers. I have started filling them up with bath/shower water (to be used for emergency toilet flushing and then pushing them under the heavy shelving that is in the garage to store. I got 6 of those dish pans at the dollar store I figure 2 for the kitchen, 2 for the bathroom and 2 for sickroom sanitation. Then I can use some of the water for flushing(Rinse water)or for the garden. 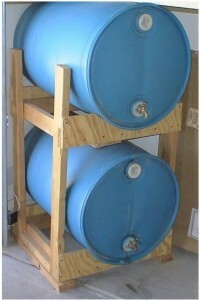 I also have a couple of rain barrels for the yard and garden. I just hate that I have to drain the rain barrels before the hard freeze of winter. I was amazed that only an inch of rain will fill a 50 gallon rain barrel. I am looking to get 2 more this winter and have them for next spring. HOW OFTEN DO YOU ROTATE YOUR WATER THEN IF NOT EVERY 6 MONTHS? 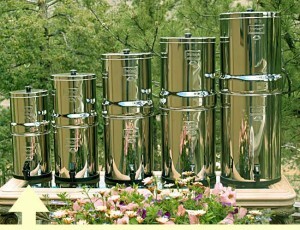 I HAVE A BERKEY LIGHT WATER PURIFIER, WHERE DO YOU GET THE REFILLS AND HOW MANY WOULD YOU ADVISE TO GET? THANKS AGAIN FOR YOUR AMAZING WEBSITE! I don't rotate my water. 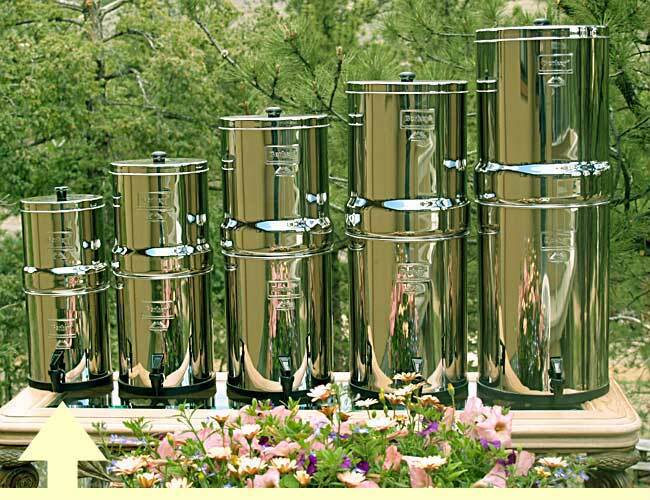 I'd speak directly with Berkey about their filters. Off topic question Kellene, but I figured you were the best person to ask. I was just reorganizing my food closet and noticed that a can of buttermilk pancake mix that I got from Walton Feed about 10 years ago was bulging. I opened it and it hissed at me! Would this be dangerous to eat, do you think? I have other cans that old and they seem to be fine. I know, I know, I should have used it, but I make my pancakes from scratch! 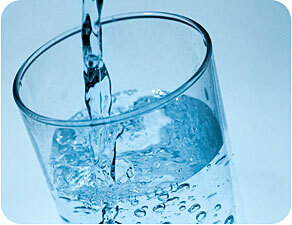 Also, do you have a source to buy bulk quantities of water purifiers? I am the EP person in our ward and this has been on my mind for some time. Here in Oregon, we don't really suffer from a lack of water, but potable water might be a problem at some point. When it comes to food, I live by a saying--"When in doubt, throw it out." The bulging has to be as the result of some sort of gas and heat combination. So no, I wouldn't risk it. Personally, when it comes to water filters, I'm more about quality than price. I trust the Berkey and the Seychelle brands quite comfortably. I have two 55 gal water containers and plan to collect rainwater. I live on the Oregon Coast ( oceanfront home, no pollution but plenty of salt air) I am looking for any suggestions on a water filter for the rainwater. Any activated carbon with silver in them will work fine as filters. I am a big Berkey fan. Thank you all for your comments. We are all in this together. I hope and pray I can find folks like you when things go south in our country. Great ideas and great questions likewise! Couldn't agree more. The more you have, the better off you are. Saving water for a "rainy day" is kind of an oxymoron, but couldn't be more true. Think of when flooding occurs and the water supply has to be boiled for safety. Now imagine you had several hundred gallons of pure water to drink. That would take a load of responsibility and worry off your shoulders, especially if you have young children. Someone correctly listed that you can buy Berkey black filter replacements at Amazon.com. The price is $99 plus shipping. I have been ordering my Berkey replacements from pleasanthillgrains.com and the price is the same. However, shipping is free if the total order is over $99. Any money you can save is money you can use to put into other things you may need. I have had great service from this company and can highly recommend them. I also get my Berkey filters and many other things from Pleasant Hill Grain. Their customer service has been superb. They also sell the Sport Berkeys which I use daily, just keeping it on my desk or taking it in the car. I've been hunting for the large blue barrels (saw them advertised on Meridian magazines website-- really want the BIG one) with the small footprint. Can't locate them Any idea where to find those? Also food grade hoses to fill them with. Here in Arizona you're nuts if you don't store water. What about bottles that go on the water cooler. I have a few of those that I'm always rotating. You can order the big ones through Five Star Preparedness. Contact them directly though. I'm forwarding this URL to my DH. We've been worried about water storage and purity issues - here in AZ, water is a precious commodity every day. In one of your other water storage posts, you mentioned that the chlorine in city water should be enough without having to use more. Our plans for the future are more "prepper-centric" than they used to be. We're slowly working out our storage logistics for food and water. Prepping is definitely a challenge to change our mindset and comfort zone, but we're learning. We have started storing water in 55 gallon barrels. You say that water out of the faucet is great to use, but what about well water. The barrels are being stored on a farm that only has a well. Do we need to treat the water now with something? I have not found that information. Can you please help???? In your case, I'd use any of the Aqua Mira water treatment solutions--treatment, not filter. OR you could use 1 1/2 cups of Clorox bleach (unscented, no dyes, etc.) per 55 gallon barrel of water. And then I wouldn't worry about it for 5 years and then rotate it. Thank you sooooo much for the quick answer. We have been wondering about this and how to protect this precious supply. Even though we have started late in the game, we are at least getting prepared. I have read a lot of your articles and the information is priceless. I have passed all of it on to the whole group so all have the knowledge. You are a blessing. Thank you for your time in teaching these things. It is more than appreciated by many. Yes, Cheryl, I'd either treat it first with Clorox Bleach or with any of the Aqua Mira treatment options. You need about 1 1/2 cups of bleach for a 55 gallon barrel. Then after you've treated the water, you don't need to worry about them for 5 years. The suggested amount is 8 drops per gallon. I love and really appreciate all of your helpful articles. I only started prepping a few months ago and am still learning and getting a grasp on all that needs to be done. It's daunting, but your articles keep me motivated! How much bleach would you suggest I use for 5 gallon Metallized Plastic Bags in Cardboard boxes? Thanks for your help! How much liquid silver would you need to purify a 55 gallon drum? I am not sure if you are asking how much liquid silver it would take to clean the barrel or to clean the water. Either way I would not use liquid silver to clean with there are better options. I believe. Thanks for your Blog!! I work for a chemical company we order new 55 gallon drums all the time. Are these safe to store food or water in? They don't say food grade but we do get blue as well as clear closed top drums. We also get large totes (275gallon) that once had isopropyl alcohol in them. These would also be great for storing plenty if water in but I don't know enough about the leaching plastic scenario.....? The ones with isopropyl alcohol in them will be fine for water. You need HEAT in order for their to be any leaching of chemicals. So long as you're not exposing your barrels to extreme heat, or setting them on cement that gets heated by the sun, you won't have a chemical leaching problem as you've described here. However, any other chemicals that were in the 55 gallon drums would have me passing on acquiring them.